It has been more than a year since we do water transfer activities using different methods to move water from one bowl or apparatus to another. They are all really simple to set up and help me keep Shaunak focused for some time. We often get distracted in this busy world where the phone is buzzing every other minute! Concentrating on a task for even 15-20 minutes seems difficult. The things will only get worse in future. And I believe, if children are taught at a younger age to stick to a task, to focus and concentrate, it will help them for life. All they need is their parents' undivided attention. It doesn't work if as a parent I ask my child to concentrate on, for example, a puzzle and I keep busy with my chores, then he too will get distracted. I started involving my son in "transfer activities" since he was 2 years. Transferring things like pom-poms, beans, marbles, etc. can keep the child engaged constructively. Did you see my post about Montessori- inspired water transfer activities Part 1? Do read it, has many interesting tools which can be used for increasing the concentration level in children. This is part 2 of the water transfer activities my 3 years old son does at home. 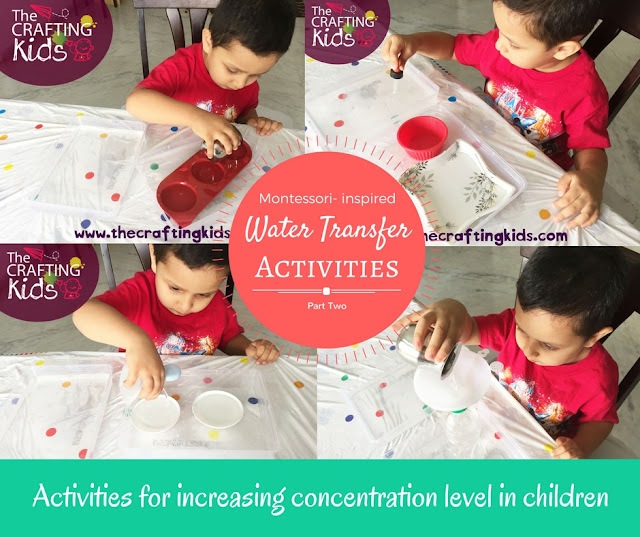 Water transfer activities can be listed under practical life skills. Since I started doing these pouring and transferring activities, I see an improved control on his hands, palms and fingers. I like to expose him to various kinds of containers- plastic, glass, stainless steel, copper, etc. I gave him a set of three bowls of equal size. And gave a him a tiny steel tumbler to fill them up with water. I asked him to count how many tumblers are required to fill one bowl. He realized he had to fill up two bowls to fill up each bowl. Squeeze bottle applies pressure on the palm and child uses all five fingers to squeeze the water in and release. Water Play with Eye Droppers is a colorful and fun activity that encourages development of the pincer grasp. The pincer grasp enables a child to pick up small items using the thumb and index finger and is important for tasks such as holding writing implements and manipulating items such as zippers, buttons and shoes laces. Water Play with Eye Droppers involves collecting water in the eye dropper from a bowl and transferring the water into plastic bottle top lids. Funnel as a tool seems very interesting to a child to watch how water falls down like a stream. I placed an old plastic bottle in a tray, placed a funnel on top of it and asked my son to pour water with a small glass. He had to fill up the glass over five times and pour it into the funnel to fill up the entire bottle. We did counting while he filled the glass with water. Funnel and stream were the new words which I added to his vocabulary. We have a tiny toy watering can, which we used to transfer water from one tray to another. It is a great tool to strengthen child's grip. It makes a child think- with how much pressure can the water be poured? Or from what height? It is fun to watch water falling down in many small streams. Hope you too have a lot of learning and focused time with your child.